In this six-session small group Bible study, Love is an Orientation, Andrew Marin leads you in peaceful and productive ways to engage the theological, political and social disconnects between the Christian community and the lesbian, gay, bisexual and transgender communities. Today's culture often defines 'bridge building' and reconciliation as a one-way street that leads to full theological, political and social agreement. Yet Christ demonstrated a different path of religious and cultural engagement to establish his kingdom here on earth. In light of such countercultural principles, the Christian community needs a new view on the issues that divide conservative believers and the lesbian, gay, bisexual and transgender (LGBT) communities. Andrew Marin uses practical applications he's learned over the last decade of living and working in the LGBT neighborhood of Chicago (Boystown), as well as his international speaking and consulting ministry, to offer a variety of practical teaching, insights, and life-lessons on reaching the LGBT community. Rather than avoiding the topic of homosexuality, Love Is an Orientation aims to equip the Christian community to bridge the gap between LGBT and religious communities. Instead of discussing how to "fix" gay people, this small group Bible study is all about getting to know them, engage them, and love them like Jesus does. After this study, you, your small group and your church will know what it means to peacefully and productively build bridges with the LGBT community. 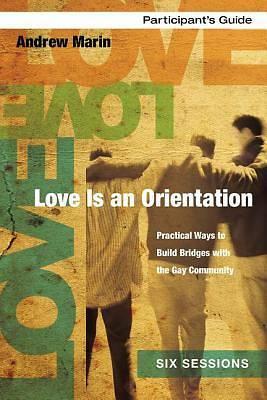 This Participant Guide is filled with insights, questions for discussion, and applications that will equip you with tools to reach out to the LGBT community in love and understanding. Designed for use with the Love Is an Orientation DVD 9780310891260 (sold separately).